The 3M Littmann Classic II S.E. 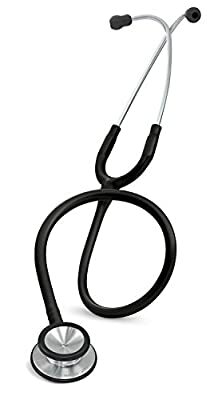 Stethoscope provides high acoustic sensitivity through its dual-sided, stainless steel chestpiece, featuring a tunable diaphragm on one side and a traditional bell function on the opposite side. Versatile chestpiece design provides high acoustic sensitivity with both a tunable diaphragm and open bell. Tunable diaphragm: Hear high or low frequency sounds by slightly adjusting pressure on the chestpiece. Non-chill rim and diaphragm provide patient comfort. Soft-sealing eartips provide an excellent acoustic seal and comfortable fit. Headset is easily adjusted for individual fit and comfort. Angled eartubes align with ear canals.